Back in 2013, salespeople for BlackRock called to tell us about their new series of iShares exchange-traded funds (ETFs) with dramatically lower fees. They clearly expected us to share their excitement, and jump at the chance to offer the funds to our clients. After all, BlackRock is the giant of the ETF world, and we’ve always been abundantly clear about the importance of securing lower expense ratios for our clients. They were gobsmacked when we said no thanks. Why did we react that way? We want partners that are wholeheartedly committed to lowering investors’ costs, and BlackRock didn’t pass the test. While the new low-cost funds were a great way to attract new assets, they did nothing for the millions of people that owned older iShares funds—and who couldn’t trade them in for the new ones without incurring big tax hits on their recognized gains. Instead, we opted to stick with a partner with a proven record of putting clients first: the Vanguard Group. 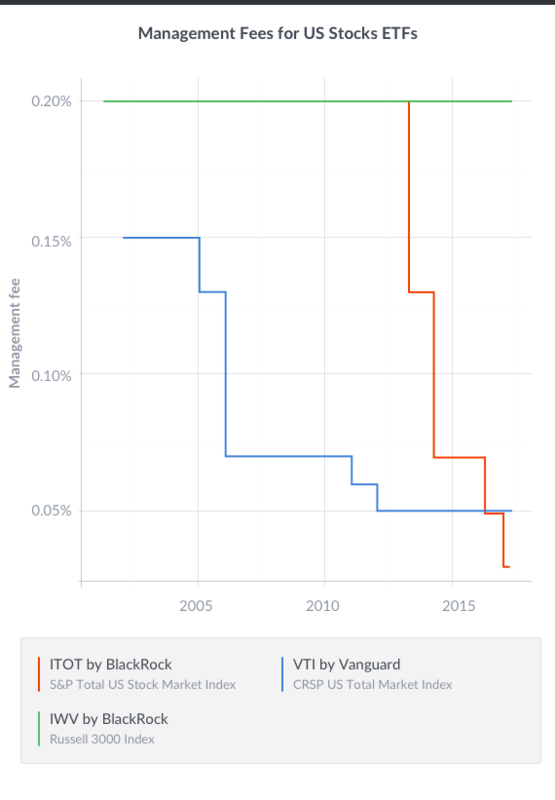 The chart below displays the management fees Vanguard and BlackRock charge for their Total US stock market ETFs. 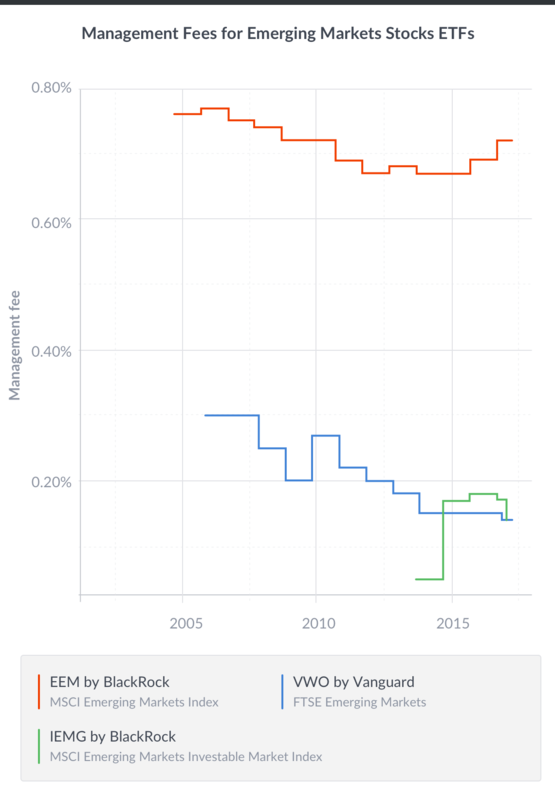 As you can see from the blue line, Vanguard has continually lowered its fee over time for VTI. In contrast BlackRock’s IWV (green line) has had the same fee for the last 17 years. It only introduced a lower-cost version of the fund, called ITOT (red line), as part of a new “Core” brand of funds in 2013, after years of losing significant market share to Vanguard. As you can see from the chart below, the difference in price between BlackRock’s main emerging market ETF and its newer “Core” emerging market fund is even more prominent. As is its practice, Vanguard steadily lowered its fee over time, while BlackRock maintained a significant price premium for the ETF in which its clients had a significant capital gain. In this case the fee difference is 0.58%. That’s an enormous difference! Despite this behavior, BlackRock continues to get a lot of favorable press from analysts and financial journalists for lowering its fees for some of its funds. If BlackRock was willing to stiff the bulk of its customers in the past, how could we be sure it would act in the best interests of our clients in the future? With Vanguard, we’re sure. The company has cut the fees on all its funds on a semi-regular basis since it was founded in 1974—not in reaction to a move by a competitor, but simply because it could. The latest move came in February. All told, Vanguard claims its expense ratios are 83% lower than the industry average, and one analyst estimates the company has saved investors $1 trillion since its inception. I’m not so naïve as to think this is a simple case of good guys versus bad guys. It’s actually a reflection of corporate structure. Vanguard is essentially a non-profit, because it is owned by the investors in its funds. Therefore any profits it earns are returned to the investors in its funds in the form of lower fees. In contrast, BlackRock is a for-profit publicly traded company. It remains highly dependent on management fees from ETFs, which were the source of roughly a third of its $11.1 billion in revenue in 2016. Cutting fees on all their ETFs to Vanguard prices (not just their new “core” share classes) would cost BlackRock over $500 million in profits, which would be an almost 20% hit to their earnings. It therefore shouldn’t be a surprise that BlackRock designed this ruse to maintain their profitability. While we love using Vanguard ETFs, they are not always the ideal choice for our clients. As we explained in How To Pick An ETF, we choose ETFs based on their fees, liquidity and tracking error. We currently offer BlackRock’s ten-year-old muni bond ETF (MUB) because Vanguard’s 20-month-old muni ETF (VTEB) isn’t nearly as large – and we don’t want to be such a large percentage of its assets that our trades would impact its performance. But Vanguard currently charges a fee of 0.09% versus 0.25% for BlackRock. Our bet is that over time, Vanguard will build the liquidity needed to justify us switching to VTEB. The investment industry does a lot of unseemly things to maximize their profits at the expense of their clients, all while covering it up with clever marketing campaigns that make you feel like you are the priority. At Wealthfront, we not only say we are committed to always putting our clients’ interests first, we have designed a business model that truly supports this goal. We put our money where our mouth is. Although this means we may forfeit some short-term profits by charging the lowest-possible fees, we believe offering a better deal is the best way to encourage more people to try our software-based approach to investing. Look around and you’ll see that large, well-run software businesses usually have little problem out-earning more labor-intensive traditional businesses. In other words, delivering you value in a delightful way should ultimately lead to a very successful business. Data on fund expense ratios through 12/31/2016 is from CRSP (Center for Research in Security Prices), and fund expense ratio data after that 12/31/2016 comes the fund’s website. Nothing in this communication should be construed as tax advice, a solicitation or offer, or recommendation, to buy or sell any security. Financial advisory services are only provided to investors who become Wealthfront, Inc. clients pursuant to a written agreement, which investors are urged to read carefully, that is available at www.wealthfront.com. All securities involve risk and may result in some loss. Wealthfront, Inc.’s financial planning services are designed to aid our clients in preparing for their financial futures and allows them to personalize their assumptions for their portfolios. Wealthfront, Inc.’s free financial planning guidance is not based on or meant to replace a comprehensive evaluation of a Client’s entire financial plan considering all the Client’s circumstances. For more information, please visit www.wealthfront.com or see our Full Disclosure. Why Do Vanguard ETFs Dominate Low-Cost Portfolios?